This article is about the British Royal title. For the current holder, see Anne, Princess Royal. For other uses, see Princess Royal (disambiguation). Princess Royal is a substantive title customarily (but not automatically) awarded by a British monarch to his or her eldest daughter. There have been seven Princesses Royal. 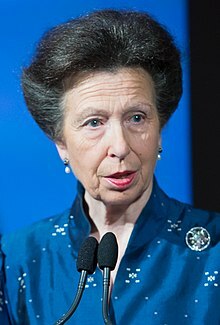 Princess Anne is the current Princess Royal. Queen Elizabeth II never held the title as her aunt, Princess Mary, was in possession of the title. The title Princess Royal came into existence when Queen Henrietta Maria (1609–1669), daughter of Henry IV, King of France, and wife of King Charles I (1600–1649), wanted to imitate the way the eldest daughter of the King of France was styled "Madame Royale". Thus Princess Mary (born 1631), the daughter of Henrietta Maria and Charles, became the first Princess Royal in 1642. Princess Mary (later Queen Mary II) (1662–1694), eldest daughter of King James II & VII, and Princess Sophia Dorothea (1687–1757), only daughter of King George I, were eligible for this honour but did not receive it. At the time she became eligible for the title, Princess Mary was already Princess of Orange, while Sophia Dorothea was already Queen in Prussia when she became eligible for the title. Princess Louisa Maria (1692–1712), the last daughter of King James II (died 1701), born after he lost his crown in the Glorious Revolution of 1688-1689, was considered to be Princess Royal during James's exile by Jacobites at Saint-Germain-en-Laye and was so called by Jacobites, even though she was not James's eldest living daughter at any time during her life. Even before the title of Princess Royal came into use in England, the eldest daughter of the King or Queen of England had a special status in law. For instance, according to Magna Carta, the barons of the realm owed aids to finance the first wedding of the king's eldest daughter; and by a statute of the 25th year of King Edward III, sleeping with the king's eldest daughter before her marriage constitutes an act of high treason punishable by death. In the House of M alternate universe of Marvel Comics, Elizabeth Braddock is the elder twin sister of the British King and bears the title Princess Royal. The novel The Lady Royal, by Molly Costain Haycraft, is a fictionalized account of the life of Isabella de Coucy. According to the narrative, Isabella was titled the Princess Royal and then later given the more 'adult' title of the Lady Royal by her parents. This is a fabrication; although Isabella, as the eldest daughter of Edward III, enjoyed the special privileges that came with her rank, she could not have been titled the Princess Royal because the title was not used in England until long after her death. The title of "the Lady Royal" has never existed. Princess Royal is an abandoned town in the Western Australian Goldfields, named for Victoria, Princess Royal, daughter of Queen Victoria. Five ships of the Royal Navy have been named HMS Princess Royal. "The Princess Royal" is also the name of a folk tune from the British Isles, and of a morris dance performed to that tune. In the Thai monarchy, the style of Sayamboromrajakumari (Thai: สยามบรมราชกุมารี; RTGS: Sayam boromma ratcha kumari) for Princess Sirindhorn of Thailand is similar to the position of Princess Royal. In the Kingdom of Tonga, Princess Sālote Mafileʻo Pilolevu is also the Princess Royal. In a number of African monarchies, the title of the principal non-spousal female titleholder in the kingdom is often translated as Princess Royal. This usually happens in kingdoms that don't make use of the higher title of queen mother. Princess Elizabeth, Batebe of Toro in Uganda, for example, often has her title translated in this manner. This happens even though it has historically meant something closer to "queen sister". ^ "The Princess Royal". The British Monarchy. n.d. Retrieved 8 July 2014. ^ a b Panton, Kenneth J. (2011). Historical Dictionary of the British Monarchy. Lanham, Maryland, US: Scarecrow Press, Inc. pp. 381–2. Retrieved 8 July 2014. ^ "Princess Royal". folkopedia.efdss.org. English Folk Dance and Song Society. 2 July 2007.